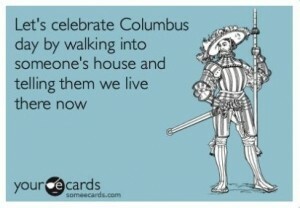 Happy (Not Really) Columbus Day! In fourteen hundred and ninety two, Columbus sailed the ocean blue. And thanks to that, a lot of Americans had the day off today– especially in D.C. I wasn’t one of those lucky ones. Instead, I spent the day at work panicking over a contractor in the U.K who disappeared when I needed him most. Does the U.K. celebrate Columbus Day too? Anyway, the rest of the fam had a lovely day hanging out without me. And there are a lot of people, quoted on the internet, with much more harsh words that that. 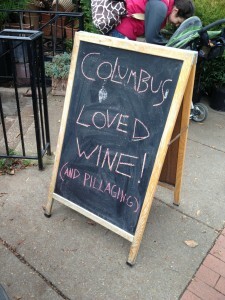 Perhaps I’ll end the day with a glass of wine while thinking about Columbus… or maybe I’ll just have a glass of wine. What’s your take on Columbus Day? Should Columbus even have a day?